Blondie becomes very impatient with sitting on the potty. The other day I kept her there by placing every clip in her hair. She loved looking at her "pree hair" in the mirror before becoming frantic and tearing them all out. Lately she has added "way" to the end of every "no" that she utters. I ask it she wants to eat and it's, "no way." If she wants to turn off the tv, "no way." If she wants to go get a diaper, (very matter-of-factly) "no way mommy." 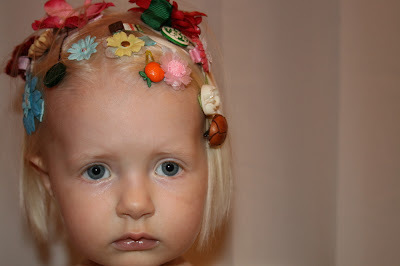 I think you have found the perfect hair clip model for Poppyseeds. Plus what a great photography studio. She can't go anywhere so at least you know the model can't run off with the products. She looks as though she takes this modeling thing very seriously too. Is that "blue steel?" Hope she didn't get the "way" thing from Jackson. It is said frequently over here. Sorry. Aww Ava! Cute! I added a crazy 8! I should come visit!